‘Rosendorf Sparrieshoop’ is a light pink – white flushed rose bred by Kordes in 1953 and is commonly called the ‘Sparrieshoop Rose’. 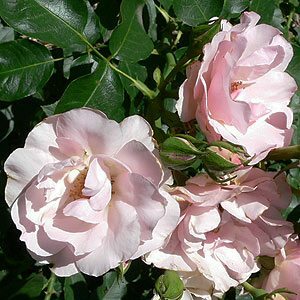 This strong growing hardy modern rose with masses of semi double flowers in spring and summer. Fragrant with pink flowers and masses of buttery yellow stamens. Regarded as one of the pioneers of ‘modern roses’ it has stood the test of time for over 60 years. Masses of semi double flowers over a long period, good thick foliage and en excellent rose for cutting and using in less formal arrangements. This is a different rose to ‘Sparrieshoop’ also by Kordes, so be a little careful with selection here. Easy rose to grow. No special treatment is required. Foliage – Good mid to deep green. Fertilize your ‘Rosendorf Sparrieshoop‘ regularly with a specialist rose food for best results.